(Skip the introduction and watch the film through the links at the bottom of the page). 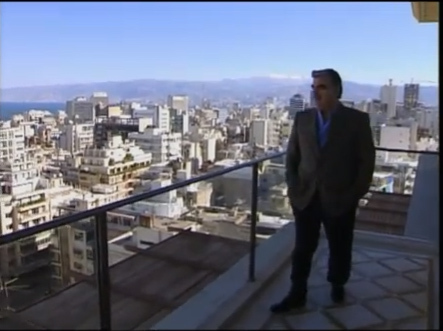 I came across late Syrian director Omar Amiralay's 2000 film about Rafik Hariri on Youtube today. The documentary was quite controversial at the time, and Amiralay was criticised widely by the left for this project. Amiralay had anticipated this critique and indeed included it in the film through a four-way conversation between him, Samir Kassir, Fawaz Traboulsi, and Elias Khoury. Khoury chides Amiralay on his naivety in thinking that his openness would be reciprocated by Hariri. The film was made during the period in which Hariri was forced out of office as prime minister by president Lahoud and the Syrian regime behind him. Hariri was plotting his return to power, putting his energy into winning the parliamentary elections that would pave the way for his return to power. This was happening against the backdrop of the debate about his 'reconstruction project', particularly in down-town Beirut where the private company he had established was in charge of this process. This is now an almost forgotten period in Lebanon's history, the assassination of Hariri in 2005 radically altered the political dynamics within the country, and even Amiralay's leftist 'interrogators' subsequently found themselves in a different position vis-a-vis Hariri's legacy. Kassir, the most vocal in his opposition to the Syrian regime, was subsequently assassinated. The film was certainly a departure from Amiralay's other works, like Everyday Life in a Syrian Village in which he examines the impact of a Euphrates river dam on the lives of nearby villagers and their relationships with state bureaucracy. Yet, the themes of development and its shortcoming and the nature of power are common factors, albeit treated differently because of the difference in context. Was Amiralay successful in getting more out of Hariri than a television interviewer? I think so, but judge for yourselves, follow the links below to watch The Man with the Golden Soles.